Folks, I’m revamping my blog a bit and getting rid of “pages” from my early days of blogging that featured multiple posts. I don’t want to lose the posts altogether, though, so I’m re-posting them. Makes no sense, huh? Believe me, if there was an easier way…!!! So, if you’ve never seen this one before it’s all new to you. If you have seen it, I apologize for the rerun but hope you can enjoy it all over again! There will be additional reruns coming into your box every couple of days until I’ve emptied these pages from the early days. Who knows…maybe what’s old can be new again with ideas. Let’s hope! Meanwhile, all new posts are on the way, too!!! 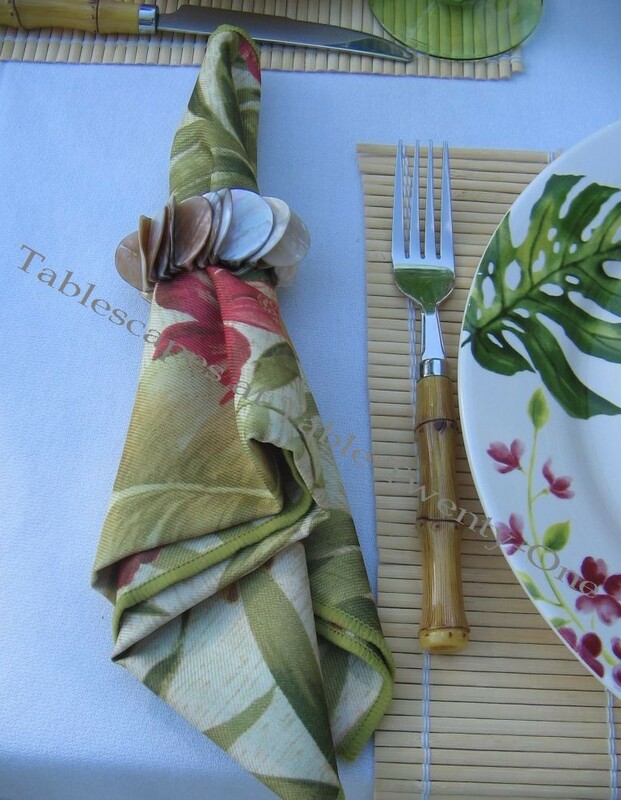 The matchstick placemats drape lengthwise rather than horizontally for a bit of added interest. 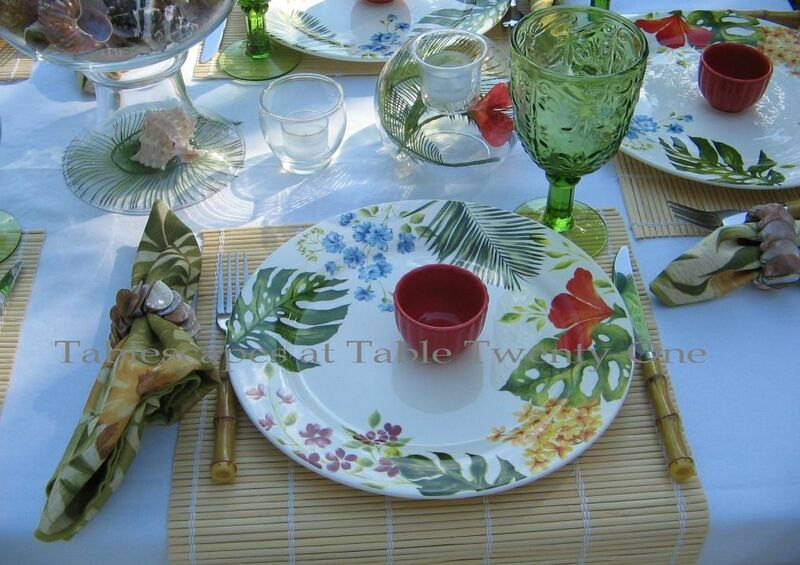 I loved these “Exotic Floral” dishes the moment I saw them at Pier 1! It wasn’t so much the pattern as the color combination with that dash of bright red-orange. The red-orange finger bowl was filled with a bit of lemon water for each guest to cleanse their fingers between bites of sticky Tequila-Lime Chicken. 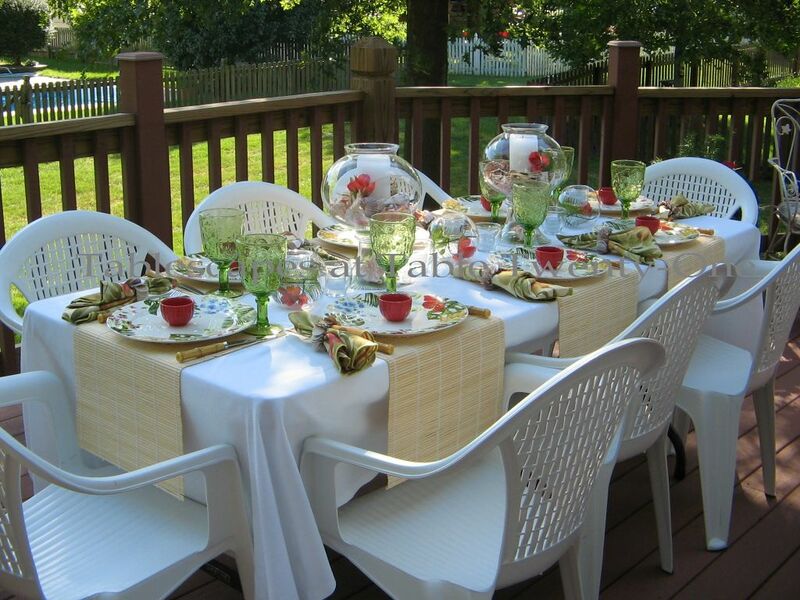 The green embossed stemware is also from Pier 1, and I’m sure you’ll see a lot of it in future posts! I picked these napkins up from BB&B for next to nothing on the clearance table! 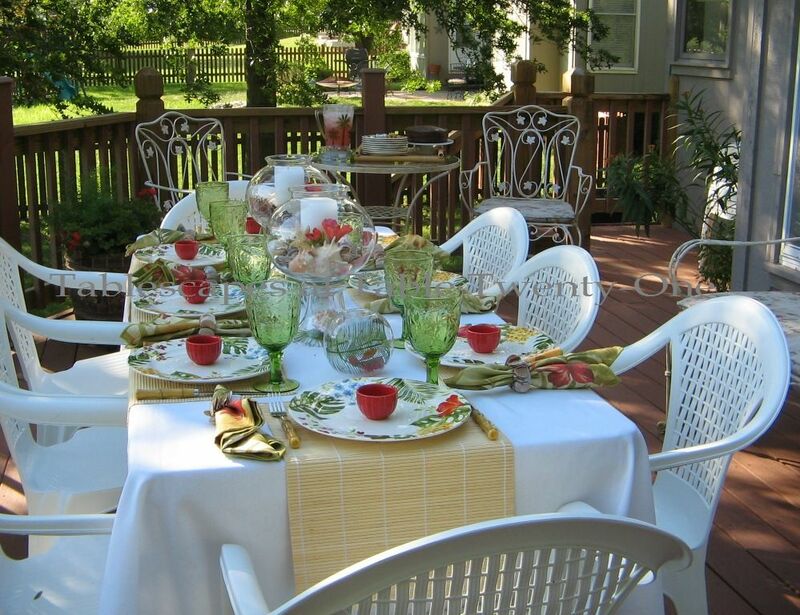 They have many of the same design elements as the dishes, so they were just perfect! 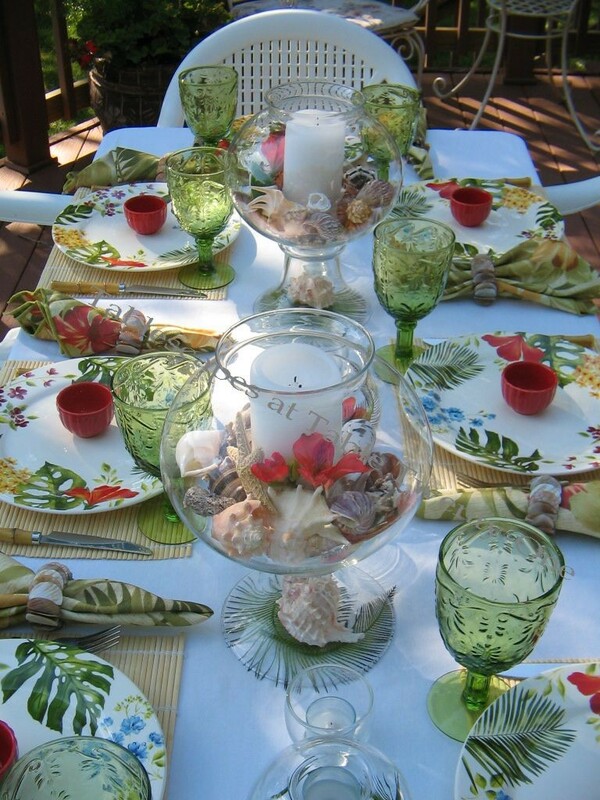 The seashell napkin rings (surprisingly similar to some custom-created ones I saw in Preston Bailey’s “Inspirations“) are Pier 1. 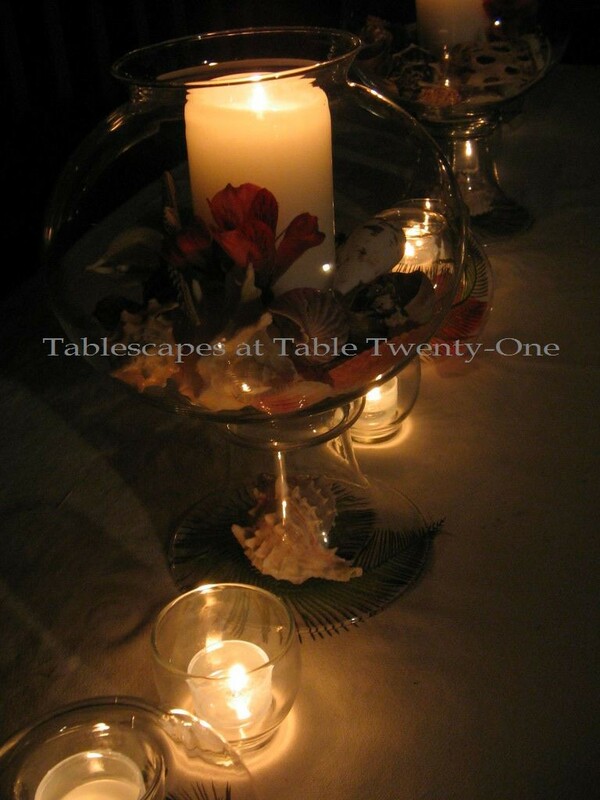 The smaller centerpiece arrangements are these really cool reversible bowls with a little indentation for a votive candle. (This bowl could be flipped the other direction and have a tiny flower in the indentation with perhaps a floating candle in the larger part.) I tucked sword fern and alstroemeria underneath. 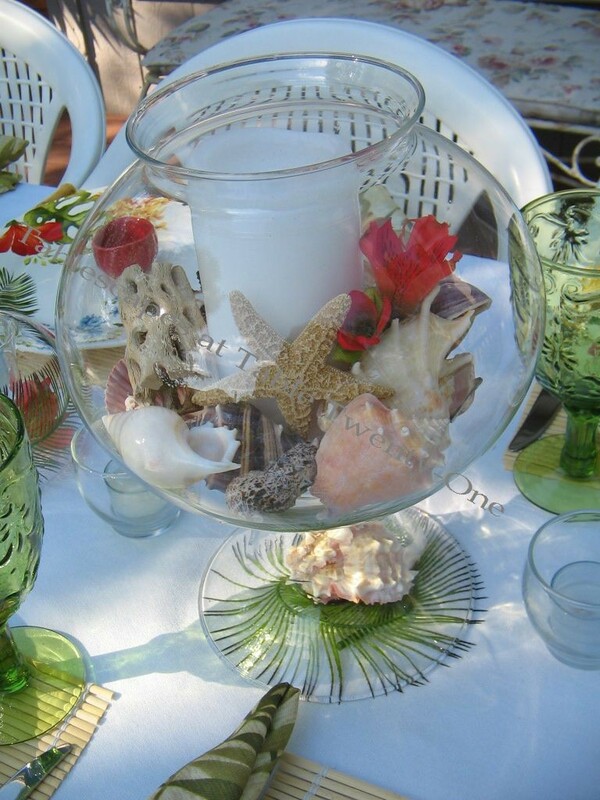 By keeping all of the centerpiece items the same shape, it created a unifying effect. 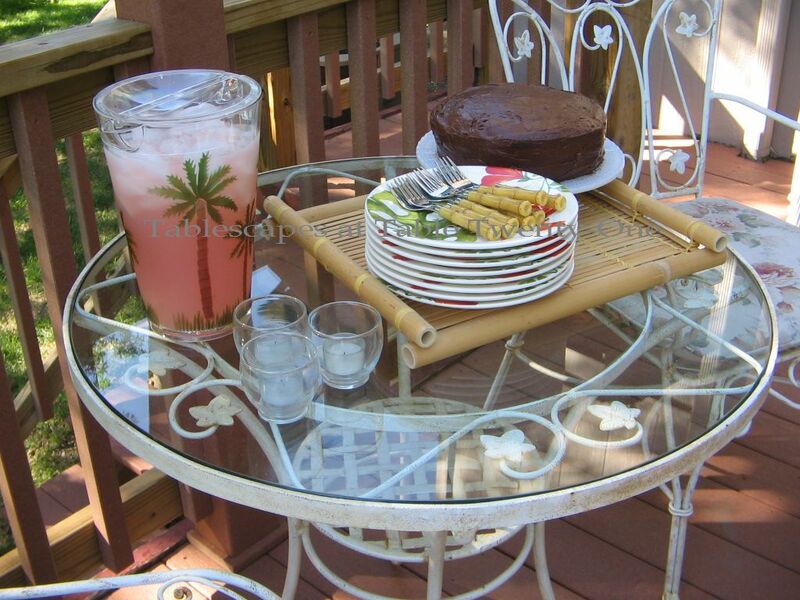 On the dessert/drink table, I piled Pier 1 dessert plates high on a beautiful bamboo tray alongside the homemade 3-layer chocolate fudge cake. 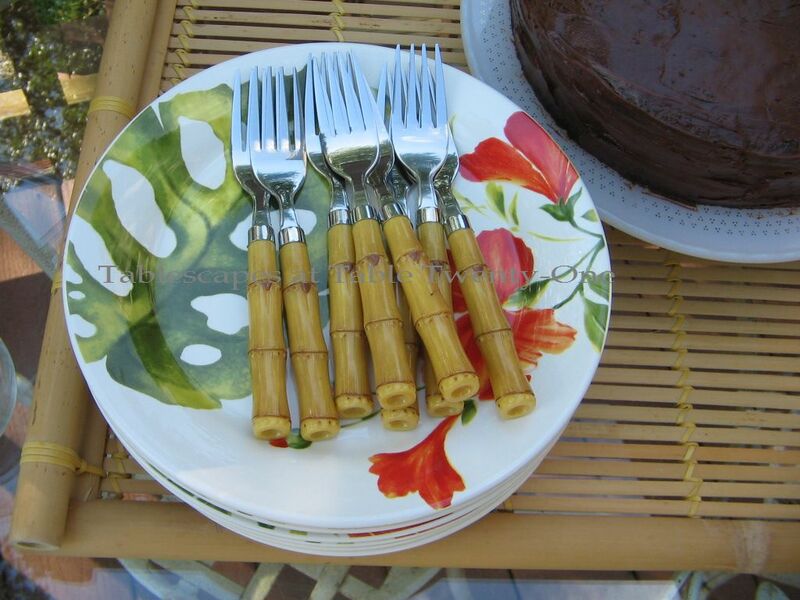 The faux bamboo flatware is from JC Penney. 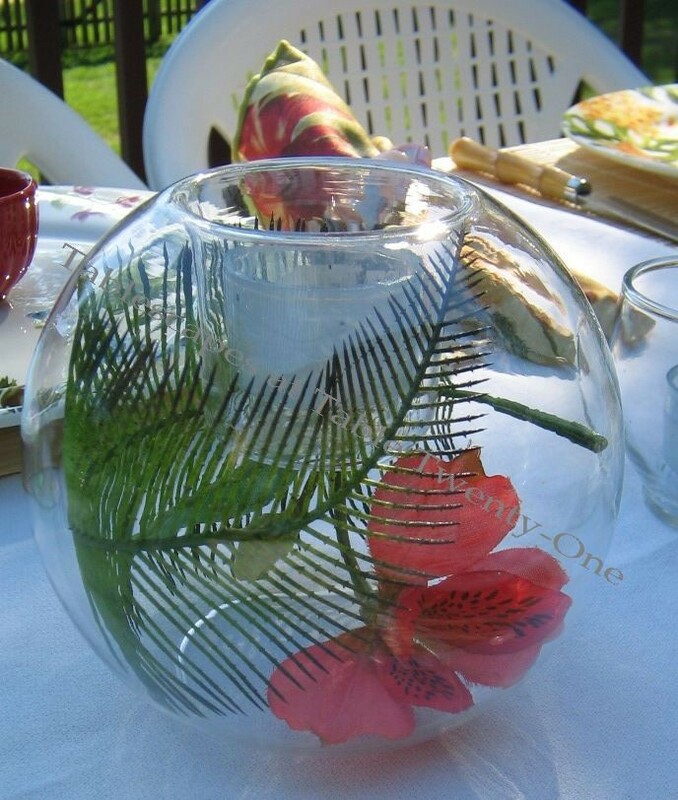 The acrylic palm tree pitcher is from BB&B. 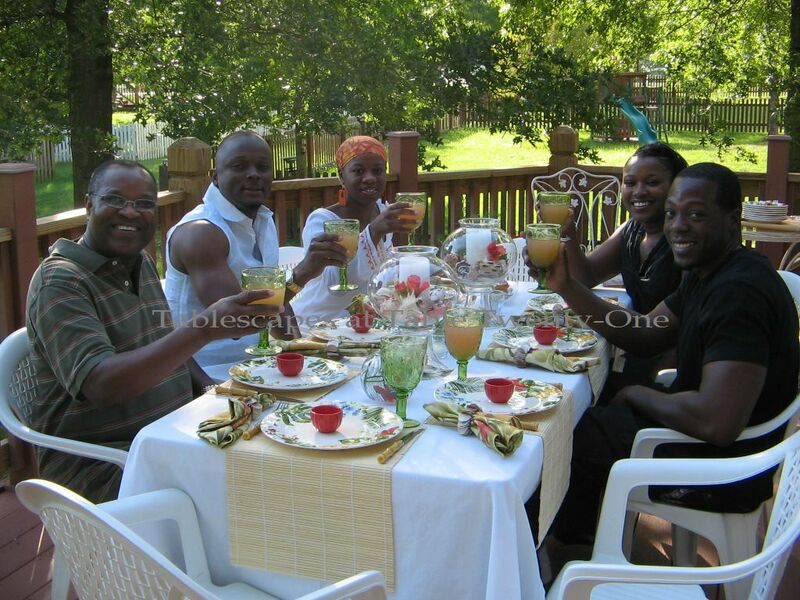 Raising a glass with our honored guests.